Sailor Four Seasons Jentle Ink has been popular for years. Within the last few years, Sailor changed the Jentle ink line by removing some colors but adding others. Many loyal customers were worried about losing some of their favorite ink colors. 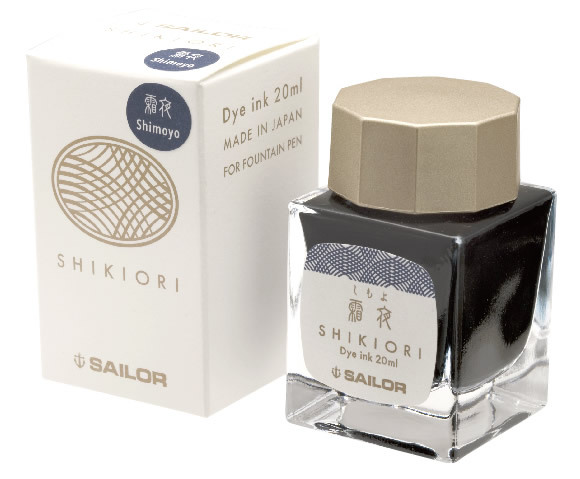 Now, Sailor Pen Company is changing the bottle of this popular fountain pen ink. Originally Sailor Four Seasons Jentle ink came in a large round shape 50ml bottle with an inner inkwell. 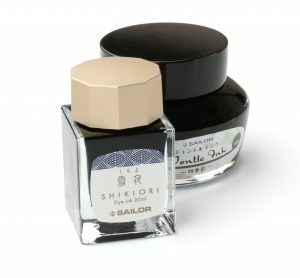 The new elegant bottle is now currently available within the Sailor Shikiori Four Seasons ink and has a rectangular design, is smaller in size, and holds 20ml of fountain pen ink. The new bottles of Sailor ink will be available shortly. We are currently transitioning each ink color as we begin to run out of stock. Although Sailor will continue to produce the same inks with the same names, the MSRP price of the smaller bottles will be $15.00. This is a reduced price per bottle but due to its smaller size, the price per milliliter is increasing. Since there is a limited quantity of the larger bottles, now is a good time to stock up on these fountain pen inks. Sailor Four Seasons Jentle Ink comes in 15 colors and are known worldwide for their quality. Sailor inks are one of our staff favorites. They perform very well, are easy on fountain pens and have some great colors. If you have never tried a bottle of Sailor Jentle inks we highly recommend them. This entry was posted in Fountain Pen Ink and tagged fountain pen ink, sailor on January 22, 2019 by Pen Chalet. This ink is the exact color of the water I see in Puget Sound right now! I’ve Sadly heard Sailor is discontinuing 50ml bottles of ink ($18.00) to 20ml (15.00). Looking at the price this doesn’t add up. If Sailor is going to be selling these tiny bottles of ink, the price should reflect the amount of ink too, which should be less than half the price of a 50ml bottle. Thank goodness for all the other brands to choose from!